Jeffrey Welch's Blog: Where Can I Get Free Puppies? The post Where Can I Get Free Puppies? by Melvin Peña appeared first on Dogster. Copying over entire articles infringes on copyright laws. You may not be aware of it, but all of these articles were assigned, contracted and paid for, so they aren’t considered public domain. However, we appreciate that you like the article and would love it if you continued sharing just the first paragraph of an article, then linking out to the rest of the piece on Dogster.com. One of the 20th-century’s greatest literary voices — I can’t remember off the top of my head whether it was Flannery O’Connor or Stevie Nicks — once wrote that there’s nothing cheaper than free. This may be true in theory, but puppies are not theoretical. They are living, breathing creatures who will depend on you for everything from food and shelter to love and exercise. If you’ve come here today asking, “Where can I get free puppies?” and are looking for definite answers about getting free puppies, you’re out of luck. You will get some vague ones, along with some useful alternatives, to be sure. Are free puppies truly free? Photography ©LivingImages | E+ / Getty Images. First, we should investigate what motivates people to go in search of free puppies. Is it the initial investment that drives people to inquire about free puppies or cheap puppies or low-cost puppy adoptions? Is it the assumption that getting a dog involves a major one-time price tag that can potentially run into hundreds, even thousands of dollars? These notions might be driven by popular or highly visible dog breeds that we see participating in televised dog shows, commercials, television or movies. They could be reinforced by the strange notion that purebred dogs are somehow superior to mixed breeds, mutts, dogs with previous owners, shelter or rescue dogs or the idea that adopting a puppy is a better or more authentic experience than an adult or senior dog. None of these assumptions are quantifiably or objectively true. Even if you do acquire free puppies, raising live creatures involves substantive investments. Money is required to feed and care for any dog, and there are significant costs in terms of your time, energy, and patience. From a strictly financial perspective, an article by the American Kennel Club details the efforts of two veterinary students from the University of Pennsylvania, Kelly Giffear and Brittany Scott, to determine the real costs of dog ownership. This study differentiates between costs of owning a dog based on size and lifespan, ranging from small dogs right through to giant breeds. Expense were further broken down by dogs’ most basic needs, from food and essential veterinary services to bedding and toys. They determined that the average cost of dog ownership in the first year alone comes out to $3,085. This amount, it goes without saying, puts the lie to the very notion of a free puppy. On average, Giffear and Scott estimated that the lifetime expenses associated with raising a dog come out to $23,410. Other sites have attempted to calculate the cost of dog ownership, such as this one from 2011, which has a much higher total, factoring in dog health insurance costs. As far as my own research can find, Giffear and Scott’s findings are the most current systematic and rational attempts to truly price out the real costs of dog ownership, both in the first year and over the life of the dog. Technically, of course, if you are not insistent on a particular breed or mix, you can find free dogs of all ages and sizes. “Where can I get free puppies?” you ask? Keep an eye out for free adoption events at your local shelters. This is the most responsible way to go about getting free puppies. You can also ask your friends, coworkers and general acquaintances to keep their ears to the ground for you. Someone’s dog is bound to have puppies eventually, and those puppies will need new homes once they are weaned, around the age of 8 to 12 weeks. 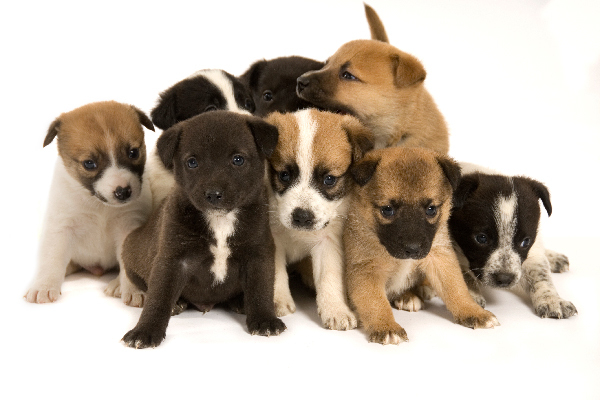 Craigslist is another potential venue to locate free, cheap or low-cost puppies. However, you need to be especially careful when researching free puppies on the internet, on something like Craigslist. From the landing page, find your home state, and drill down to the metro area closest to you. Under the “Community” heading, there is a category labeled “Pets.” From that point, you’re on your own. If you choose this route, read the listing in full and ask as many relevant questions as possible. Why are they giving the dog away? Is he vaccinated, spayed or neutered? Fostering a dog: You can work with a local shelter or rescue and take a puppy or dog into your home on a limited basis. This can give you a taste of dog or puppy ownership without the lifetime commitment. Visit or volunteer at a dog shelter or rescue: There are many nonprofit, no-kill shelters nationwide that are always looking for dependable and devoted volunteers. The fact that there are rescue organizations dedicated to specific breeds means that you can get exposure to the minutiae of a dog breed without leaping headlong into ownership. Engaging in time-limited activities with reputable organizations like these in your area can prepare you for the responsibility and investment involved in the long-haul of puppy or dog ownership. And, bottom line, there are truly no free puppies! Thumbnail: Photography ©Photology1971 | Getty Images.